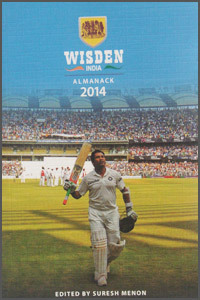 The second edition of Wisden India shares certain similarities with the revered yellow version not least the same cover photo – in blue – of Sachin Tendulkar leaving the field for the final time. Unlike the Wisden Cricketers’ Almanack, Wisden India concentrates on cricket in the sub-continent and gives lavish detail on major and minor matches played in, naturally, India as well as Pakistan, Bangladesh, Sri Lanka and gives coverage also to Afghanistan and the United Arab Emirates. For this second edition, there is naturally much coverage of Tendulkar in a forty-four page chapter which includes articles from team mates, opponents, his remarkable career statistics and, indeed, the Little Master’s valedictory speech after his last Test. It was fitting that this Test was his 200th and was held in his home town, Mumbai. For Wisden India there are six Cricketers of the Year and, for 2014, the recipients are M.S. Dhoni, Ravindra Jadeja, Cheteshwar Pujara, Rangana Herath, Misbah-ul-Haq and Mushfiqur Rahim. A Hall of Fame welcomes legendary Indian cricketer, C.K.Nayudu, and, of more recent vintage, Anil Kumble. One person to be acknowledged within Wisden India’s 2014 coverage although not officially recognised with one of the above honours, is Rajinder Goel, possibly one of the best bowlers never to represent India in the excellent article on 80 years of the Ranji Trophy. The IPL may these days be one of the first aspects which cricket followers think of when considering Indian cricket but, whilst there is decent coverage of the 2013 edition, it certainly does not steal the show and recognises fairly all cricket played in the Asian countries. The blue edition follows a similar layout to the main Almanack giving excellent coverage of not only domestic cricket in the sub-continent but also international series. Book reviews, many interesting articles by some of the best and well-known writers of the sub-continent make this an excellent book. In India, this is a snip at the equivalent of seven pounds and, even if it is likely to cost a little more to find and buy in the U.K, it is most certainly worthwhile.